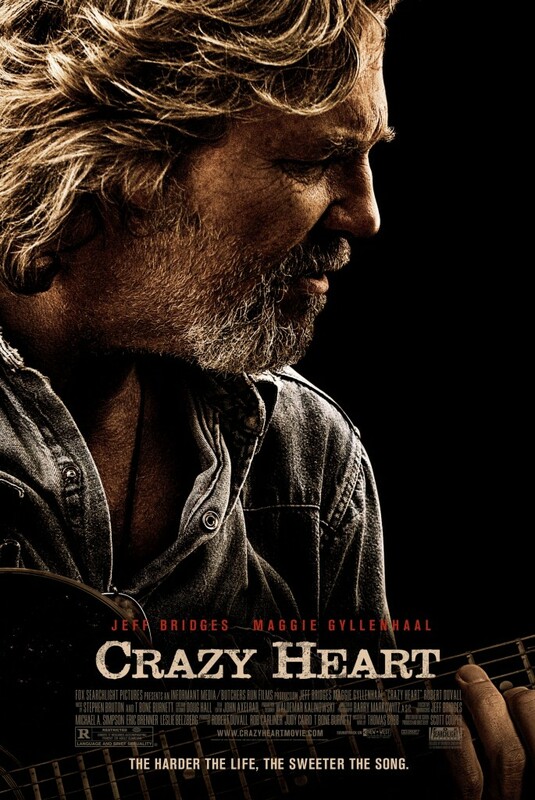 I am so thankful I was finally able to watch 'Crazy Heart'. 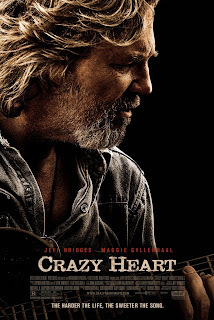 I have wanted to see it since I first heard about it and was even more interested when Jeff Bridges received the Oscar nomination. He completely deserved it by the way. This is one of those movies that just sticks with you. It may be a slightly conventional film when it comes to story of a has-been musician and it plays out with little surprise, but the performances and the heart these actors put behind this material makes it all the more real and affecting. The biggest thing to love about this movie though is Mr. Bridges, hands down. As Bad Blake he epitomizes what country music is supposed to be and he does with with such charm you wish he actually was a country singer. For such a small film it has an amazing supporting cast as well, I like Maggie Gyllenhaal, I really do, but she plays white trash so well it makes you kind of detract from her. She is understandable here and has one of my most unforgettable moments in the film, but the one thing the film doesn't get across well enough to support her decision is the reason behind the attraction she has for Bad. Yes, he's appealing and has that charm, but he is much older, overweight, an alcoholic and has no money to support him let alone her and her child. What about him makes her think everything will be okay if she forgets all those things for the time being? It is one loose end and a detail that can just as easily be looked over. What is essentially cameos from Colin Farrell and Robert Duvall are bright moments in an otherwise cloudy-toned atmosphere the film creates. Farrell is especially effective here as Bads protege Tommy Sweet. He is made to be this unlikeable dirt bag who left Bad in the dust for money and fame, but when we actually meet him about halfway through the film , he is a much more complex character than that. Farrell plays him with the perfect balance of humble and celebrity. He is willing to help Bad to the best of his abilities as long as Bad cooperates and goes with the flow of things. We like Sweet, sometimes more than we like Bad. As for Duvall, he brings Bad back around to right where he needs to be, helps him see the light of day and is the cutest old man here (something I never thought I would say about Mr. Duvall). Besides all of this the music is great. I will definitely be buying the soundtrack and will listen to it often, just to get a sense of how great and rough yet pure Bad's style of country is. Just like the movie in which it comes from.